Green LED for nav light with green lens. 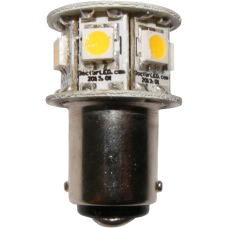 This 12V HEX GE90 LED bulb is specially designed as a direct replacement for most trade #90 and #1004 bulbs for incandescent navigation anchor lights available on the market such as the Fig. 337 from Perko and other manufacturers.